That will be terrible. If Google does this, it will be dammed. This company that self-claims "don't do evil" will become the son of Satan completely. It will not only be condemned by global users, but will also be marginalized in China. It's true that representatives of Google, when talking to me and various journalists, have been making much of the fact that Google.com will remain available to users inside China. If it becomes completely unavailable, and Google does not try to fight government moves to block Google.com, they will have gone several more steps in buttressing the Chinese Firewall. Meanwhile, people are starting to test out the new Google.cn and see how Google's censorship compares to other people's censorship. It will be interesting to see how things evolve over the coming weeks. After playing with various search strings the Open Net Initiative's Nart Villeneuve concludes: "This filtering is quite similar to the filtering conducted by domestic Chinese search engines." He provides a list of websites (like Human Rights Watch, Radio Free Asia, etc.) which he concludes have been "delisted from Chinese Google." You’ll notice that the top results for the search on the US search engine are for wikipedia pages. Wikipedia is currently blocked in China - evidently, Google.cn is not providing links to these wikipedia pages in compliance with the wishes of the Chinese government - Google.cn results don’t include the wikipedia pages. It’s also worth noting that the Google.cn search lists about 11,000 matches while the Google.com search lists almost 50,000 matches. That’s a pretty major disparity. My schedule over the past 24 hours has been nuts so I havent had the chance to play with Google.cn I would have liked, but I went on Google.cn and did a search with the Chinese characters for "Dong Zhou" village - where police recently shot unarmed villagers - to see what would happen. The search turned up a number of results talking about the incident as a "blood crime" or "massacre". At the bottom of each page of results there is a notice to the user: "In accordance with local law, regulations, and government policies, a portion of search results are not shown." 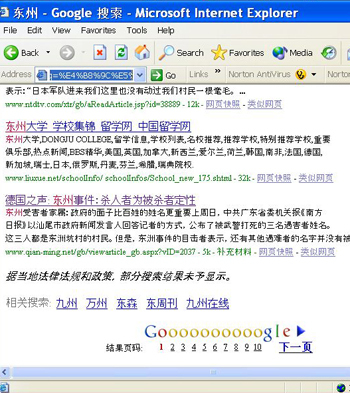 A search in Chinese on google.com, not surprisingly turned up a lot more results critical of the shooting - including pages from dissident websites that have been removed completely from the Google.cn search universe. Similar results for Dong Zhou on Yahoo and the popular Chinese search engine Baidu showed only benign tourist and commercial information - on the first few pages of results anyway. There is no notification to the user anywhere that results have been filtered. Going forward, it will be interesting to see whether the Google.cn search results begin to resemble Yahoo's and Baidu's more closely over time, or whether Google.cn's filtering remains looser than the competition's. 1. Make its "block list" public, and disclose the laws, regulations, and procedures that have required these specific words and URL's to be blocked. We're respecting Chinese law, right? So name the laws you're respecting and how you're respecting them. 2. Fight to prevent Google.com from being blocked, and if it does become completely blocked, consider discontinuing Google.cn. 3. If the Chinese government makes unreasonable requests for search result data, do the same thing you did to the U.S. Department of Justice: just say no. Othewise, you'll be sending the message that you respect U.S. users much more than you respect Chinese users. 4. Establish clear procedures for your local China-based staff: if a government official calls your Beijing office demanding particular information be blocked or handed over, the request must adhere to strict company protocols and procedures so that senior management can rest assured that the request was indeed made and handled in accordance with laws that actually apply to the situation at hand, and whether the information in question even falls under the jusisdiction of those laws - and that any action taken by the company was done in keeping with the company's code of conduct. It's pretty common for low and mid-ranking officials in China to make orders on their own initiative to protect their own personal interests or interests of their friends (or people who bribe them) - these are often orders that don't actually reflect central policy. Major multinational companies should not be rolling over and playing dead every time some cop picks up the phone and says "boo." 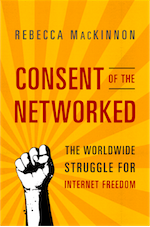 Right now most information technology companies operating in China don't even defend the rights and interests of their users to the full extent of Chinese law. Will Google try to be different? Will they succeed in being different? Or will they submit passively to full castration like the others have done? Let's see. One question...how come the world is currently going mad over the Google story and yet the MSN My Space stuff was largely ignored by print and broadcast media? I am disappointed in Google. I just thought they were cooler than this. Google would make a better case of not "being evil" if they were to put the disclaimer before the censored search results, so everyone knows that what they're getting is the Chinese government's search results, not Google's standard results. I write about this further in an open letter to Google. Don't think the censorship makes sucha big difference. Those who want to are able to access everything by using proxies. I met Larry & Sergey last year at the WEF- they were on their way to becoming $10b men - but they were cool in a hacker geek kind of way - guys you could hang out with at a taco joint. But, I fear that our two hobbittses likeses their rings too much - the darkside calls. Iwrote about this here. The main thing is that Google has a corporate philosophy that is DIRECTLY in opposition to what they are doing. In other words, they can defy the US govt. but not the Chinese govt. You have to ask why... and the answer is the almight yuan. Major multinational companies should not be rolling over and playing dead every time some cop picks up the phone and says "boo." Right now most information technology companies operating in China don't even defend the rights and interests of their users to the full extent of Chinese law. Yahoo Hong Kong rolled over for the Shanghai (IIRC) Public Security Bureau, which doesn't even have any jurisdiction in the Hong Kong Special Administrative Region. Dear Rebecca, but you made a primary mistake by saying "Chinese laws" which is a trap set by the shameless money hogs like yahoo etc. In fact, there is *NO* LAW in China, but only the despot's rules. Rules are not laws. Any person equipped with enough brute force can enforce rules on a group of people, just as how the gangleaders do to control their understrappers. Laws are in the first place social contracts, not to be signed under threats. Yes, you can’t be more correct! You should back the Gestapo by providing them the cinerator, because you’re not Amnesty International for the Jewish people. You never are. And yes, there are worst people than you are, so you’re morally remitted.